The art of displaying merchandise for sale, as well as procedures for receiving and handling stock, were some of the skills YES Centre students learned at a recent retail course. 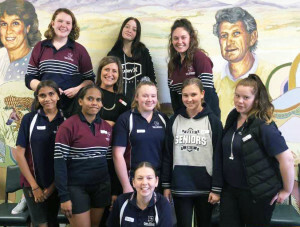 Nine YES students attended the course, held at TAFE SA Port Augusta on October 30 and November 5, which provided valuable training in the retail services industry. This course also aimed to enhance students’ communication and teamwork skills, prepare them to work in retail and sales. Successful completion of the units provided 10 Stage 1 SACE credits for the students. The course was delivered by TAFE SA lecturers Nicola Danby and Julie-Ann Thompson, supported by YES lecturer Mrs Kristy Kuhn. The course allowed students to get a feel for the industry, understand how to receive and handle stock within a work environment and how to create visual displays for retail merchandise,” Mrs Kuhn said.